Our Company - Apollomics, Inc.
At Apollomics, we are a purpose driven company imagining a world without cancer. We let science drive our decision making to advance our programs. We believe in the power of partnerships to enhance our pipeline and broaden the patient populations we serve. Our existing pipeline consists of six development-stage assets including three novel, humanized monoclonal antibodies that restore the body’s immune system to recognize and kill cancer cells, and three targeted therapies against uncontrolled growth signaling pathways. Our name is derived from the Greek verb 'apollymi' which means "to destroy", and 'omics' is a term used for large amounts of biological data. In Greek mythology, Apollo is the god of healing. Our new identity reinforces our mission to utilize sound scientific rationale to eradicate cancer and improve the lives of cancer patients. 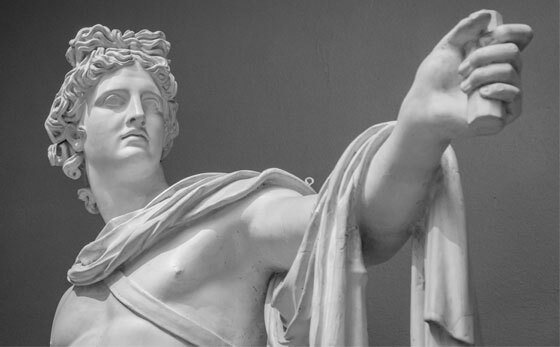 Apollo is the god of many things, including medicine and healing. Symbols associate with Apollo capture our spirit and are reflective of our core values. The bow & arrow symbolize our MISSION to eradicate cancer. The snake & rod symbolize our PURPOSE to heal patients. Apollo's lyre symbolizes our VISION to be a global leader in the development of novel medicines for cancer patients. Our visual mark is a symbolic play of Apollo's musical instrument, the lyre. The two circles represent patients while the two colors represent a dance of the east and west joining in a common goal to fight cancer. Learn more about our management team and what drives us.